The frenzy of building a nest, finding a mate, then laying the eggs, is over for most of the birds on my river. Gone are the early morning choruses proclaiming territories. “Keep out!” “This tree is mine!” No more songs to announce the rush of testosterone. 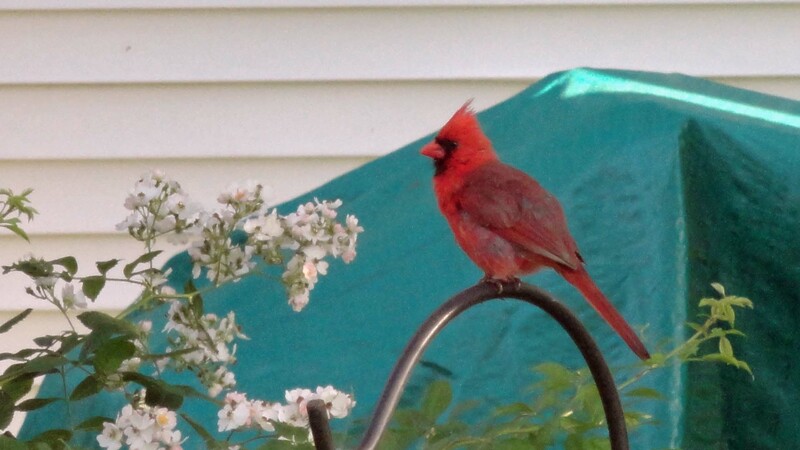 “Look at me, how beautiful I am!” Yes, spring was a time of frantic movement. The rush to mate and produce offspring has slowed. Summer is drawing near with her warm nights and lazy, hot afternoons. Spring is leaving as the fledglings are leaving their nests. The Baltimore oriole young have hatched and flown away. Dad is no longer proclaiming his territory and mom has stopped the frantic search for insects to keep her babies crops filled. The frenzy of spring is ending as summer nears. The only songbirds left to play house are the American goldfinches. They wait until the thistle is in bloom before producing a brood. For now, they’re content to watch how the other species get by. 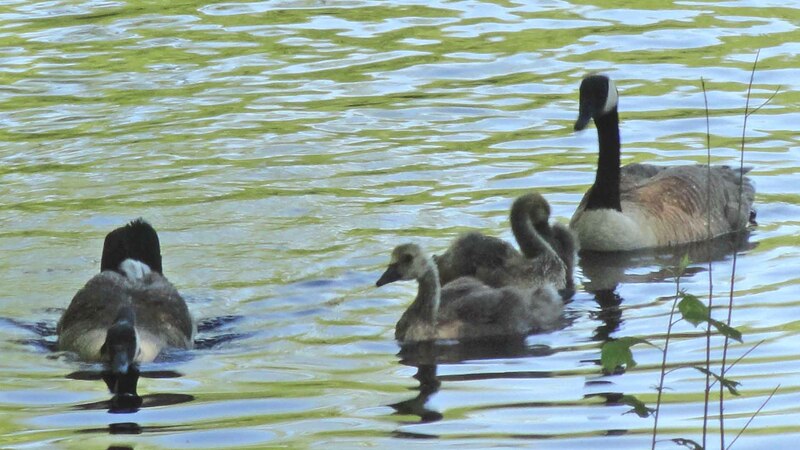 Some geese arrived with their gangl y goslings. One of the parents didn’t like when I got close to take the photo. He (or she, but most likely he) postured and hissed until I went away. Maybe he and his mate are like Kim and Kanye — no free baby pics. 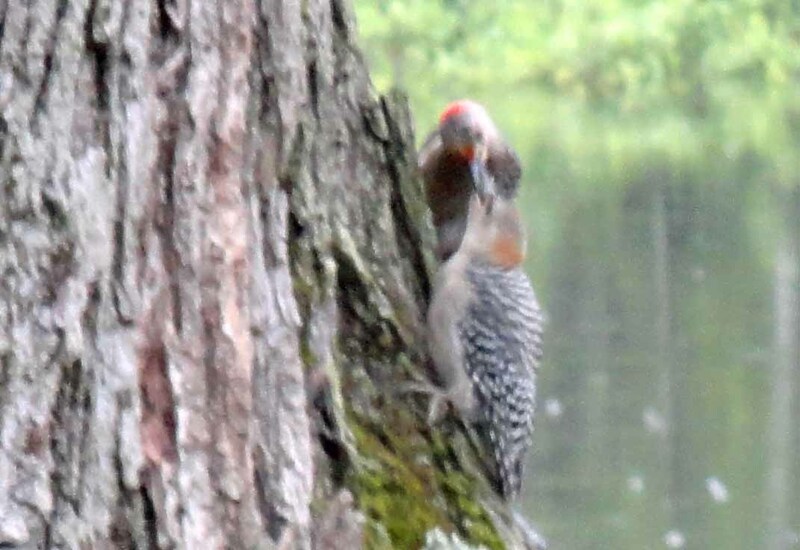 A pair of Northern flickers have been visiting the suet feeder with only one offspring. 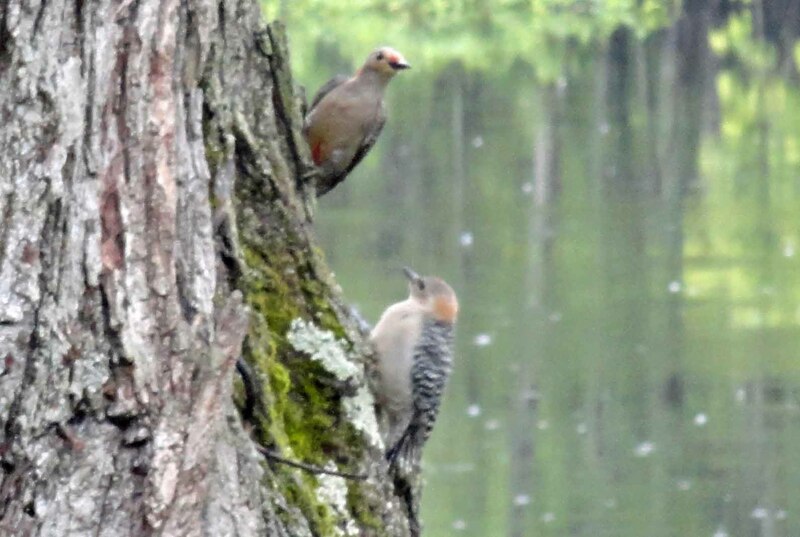 Since female flickers tend to lay five to eight eggs, it’s not hard to imagine what happened to the other offspring. I read once approximately 80% of songbirds die within their first six months of life. Many don’t even make it out of the egg, due to nest robbers like crows. Even the weather plays a factor. But, back to my flickers. They have one awesome offspring who follows mom and dad around looking for a handout. Even though junior is as big as the parents, they don’t seem to mind. First to the suet feeder, break off a piece of suet, back to the tree, place suet in junior’s mouth, back to the feeder — back and forth. While all the time junior clings to the tree, flutters his wings and makes soft squeaks. 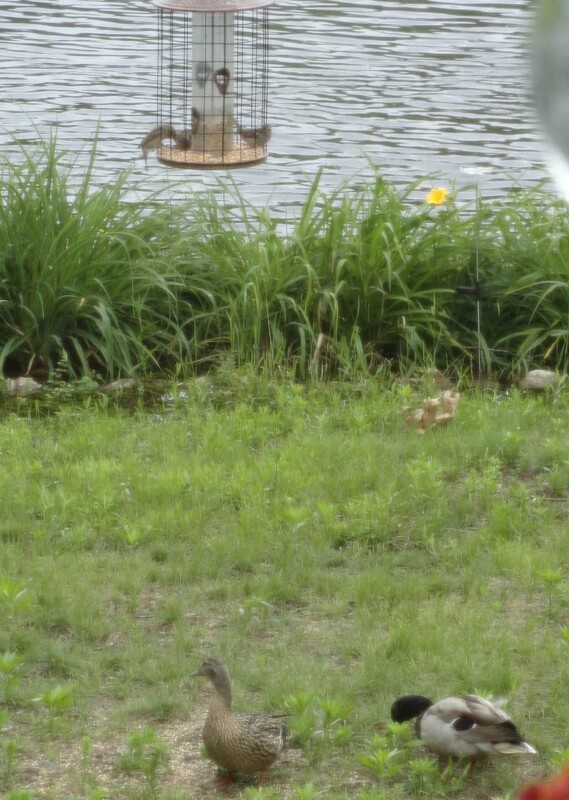 It’s been a week since Mama waddled onto my grass but another pair of Mallards stop in for a bite each day. Instead of bread, the hen prefers the wild bird seed that falls out of the feeder. They’re not very sociable, leaving the yard whenever I come onto the porch. Sigh, still no babies. Flood update – the river is high, my yard is flooded, and the sump is working like a champ. Not the sump that came with the house, oh no. 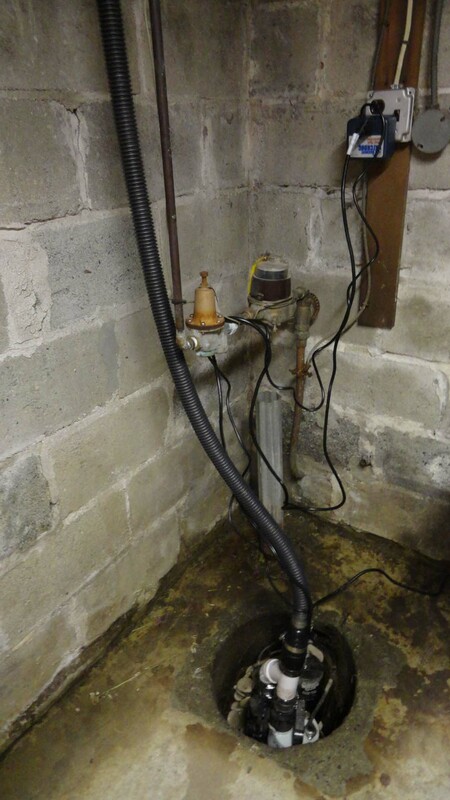 I should have insisted the home inspector try the sump. “Naw, it looks good and, besides, it’s too cold to test it.” Well, it was a piece of junk. Thank goodness for Lowe’s and quick credit approval. Four hundred dollars later and several trips to the local hardware store for tubing, clamps, chocolate, and a scratch ticket, the new sump is keeping the Concord River at bay. It took me all day Friday and into the night, but I did it! It’s been pumping two gallons of water every 35 seconds for the past three days. The hose exits onto my driveway and I can hear the “swoosh” the water makes as it comes shooting out and hits the pavement. My electric bill is going to be through the roof, but at least my cellar is dry. Thank you Lowe’s! 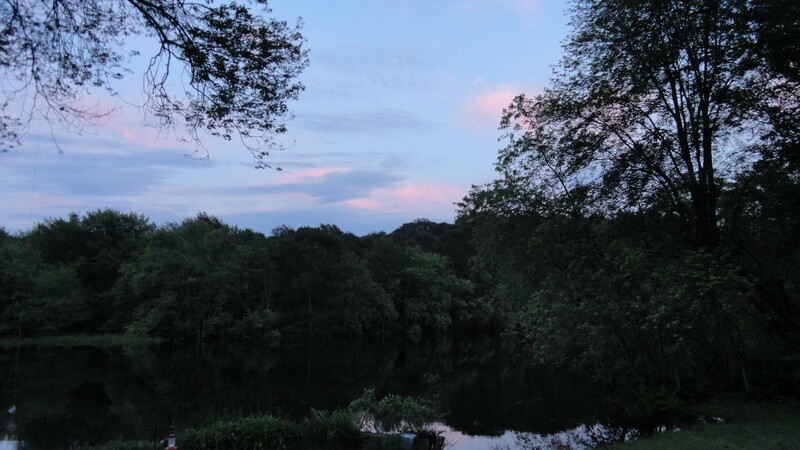 When people ask me why I bought a house on the Concord River, I try to explain how 90% of the time it’s paradise. Sure the yard is flooded, but I’ve got my Wellies to keep my feet dry. Okay, so the electric bill is going to make me vomit, but that’s why I work, to pay the bills. Even with my yard turning into a swimming pool, the scents and sounds of the river are magic, pure magic. There is no place on Earth I would rather be. Not even Tuscany. This is where I was meant to live. This entry was posted in Life on the Concord River and tagged American goldfinsh, Baltimore Orioles, basement, buying a house on the concord river, chocolate, common flickers, concord river, driveway, dusk, electric bill, flood waters, flooding, hardward store, home improvement, install sump pump, Kanye West, Kim Kardashian, life on the concord river, Lowe's, Mallard, Northern flickers, ode to spring, pumping, scratch ticket, spring, summer, sump, sump pump, sunset, Tuscany. Bookmark the permalink. I love the trip to the hardware store for clamps, tubing, chocolate and a lottery ticket.